Arrive at Johannesburg International Airport off your international flight. After collecting your luggage and clearing customs, a representative of The Tourist’s Friend will meet you in the Arrivals Hall, holding a board with your names on it. He will hand you your airline tickets, and then accompany you to the check in counters for your British Airways flight to Victoria Falls Airport. Flight BA6285 departs Johannesburg at 11h25, arriving in Victoria Falls at 13h10. Check in time will be at least 1.5 hours prior to departure time. After clearing customs and immigration at Victoria Falls Airport, a representative of Falcon Safaris will meet you in the Arrivals Hall. You will be required to purchase visas for Zimbabwe at Victoria Falls Airport – the cost will depend on your passport nationalities – from US$30 – US$55 per person. Your Guide will transfer you to the Kingdom Hotel, 20 minutes drive from the Airport. The Kingdom Hotel is a large resort style hotel in the centre of Victoria Falls with many restaurants and bars to choose from. Modern and nicely decorated rooms with all the facilities you would expect. The hotel is just a short walk from the Falls themselves, for which there is a US$20 per person entrance charge. At the Kingdom hotel you will be accommodated in a Standard Twin Room with en-suite facilities, on a bed and breakfast basis. Dinner may be taken at the hotel restaurant, and will be for your own account. Additional activities may be booked directly at the hotel, with their Activities Desk, and will be for your own account. After breakfast and some more leisure time at the Kingdom Hotel, a representative of Falcon Safaris will collect you from the Hotel at 10h00, and they will transfer you across the border, into Botswana, and on to Chobe Safari Lodge. This transfer will take approximately 1 hour. Chobe Safari Lodge is situated on the banks of the Chobe River, just outside the Chobe National Park, which is famous for its large elephant and buffalo herds. The area offers unique beauty, with the Kwando, Linyanti and Chobe River system forming lakes, Falcons and floodplains. You can relax in comfort at the lodge, with spacious accommodation affording great views of the surrounding area. The pool area is directly adjacent to the Chobe River, and the lodge offers a range of activities to keep you busy. Game drives and river cruises into the Chobe National Park provide excellent game viewing opportunities. You could go on walking safaris with an experienced guide, or go fishing for a relaxing day outdoors. At Chobe Safari Lodge you will be allocated a Luxury Safari Room with en-suite facilities and a view over the Chobe River. After lunch, later in the afternoon, you will go out on a private 2-hour boat cruise on the Chobe River. Dinner is taken in the Buffet overlooking the Chobe River. During your stay at Chobe Safari Lodge your Breakfasts, Terrace Lunches and Dinners are included in your Tour, although drinks should be paid for directly. Chobe’s wildlife roams in profusion and diversity. It is home to the largest concentration of Elephant in Africa and during the dry season the herds congregate along the fertile flood plains of the Chobe River. Large herds of Buffalo also concentrate on the floodplains during the dry season. Other major species such as Lion, Wild Dog, Puku, Red Lechwe, Sable and Roan Antelope are encountered in many areas of the Reserve. After breakfast, you will go out on a River Boat Safari cruise on the Chobe River enabling you to view wildlife that congregates at the waters edge at very close range in all safety. You will return to the Lodge for a rest during the heat of the day (Chobe Safari Lodge has a swimming pool and sun deck), and in the afternoon you will enjoy a 3 Hour Game Drive in the Chobe National Park. An early morning wake-up call, and then off ‘on safari’ in the Chobe National Park, home to huge herds of elephant. You will travel in a 4×4 game-viewing vehicle with a Guide. After breakfast back at the lodge, you will be driven back to Kasane Airport, where your pilot will meet you, and fly you to Pom Pom Camp, 80 minutes away across the Okavango Delta. On arrival at the Pom Pom airstrip the Guide who will be looking after you during your stay there will meet you. Depending on your arrival time in camp, a lunch will be served. You will then have time for a little relaxation before your afternoon / evening activity. Following the afternoon tea, you will depart on a game drive in an open 4×4 Land Cruiser, stopping for a break and a traditional Botswana “Sun downer”. Hippo and crocodile are found in the deeper lagoons in the area. Birding enthusiasts will enjoy sighting Pelâ€™s fishing owl, African fish eagle, giant eagle owl and white backed vultures. You will return to camp in the dark, using a spotlight to hunt for nocturnal species. Night drives provide an opportunity to see nocturnal sightings of leopard, springhares, genets and other small cat species if you are very lucky. After the drive, you will enjoy an outdoor dinner overlooking the Okavango, and share the evening with the others in the group around the campfire. After a light breakfast and an early morning activity and brunch, you will be transferred to the airstrip for your charter from Pom Pom Camp to Maun Airport (20 minutes), where a representative of Meno-a-Kwena Camp will meet you. He will drive you to Meno-a-Kwena Camp, situated about one hour and thirty minutes away. Meno a Kwena Tented Camp prides itself in getting seriously involved in local tribal community development projects to create an increased awareness of the importance of the countryâ€™s wildlife resources, and therefore its preservation. This is the conservation action they have taken to secure a future for the regions wildlife potential through maximum benefits to the people and wildlife of the Boteti in the Kalahari region of Botswana. Southern Africaâ€™s largest remaining zebra and wildebeest herds, dependant on regular drinking water, migrate within the Makgadikgadi and Nxai Pans ecosystem. There are numerous desert-adapted animals and birds that move through the area in search of grazing and browse. This very diverse system, contrasts between riverine and open saltpan habitats with varying woodland and scrubby vegetation. 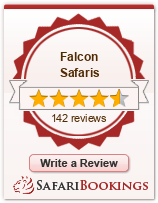 The tented safari camp is an experience in itself. All the tents are pitched on a cliff overlooking the dry Boteti riverbed, where Meno A Kwena provides water for wildlife to drink in full spectacular view of the camp. The river hasn’t flowed in over ten years. Unique vistas by Botswana standards! The tented safari camp is themed around the former mobile safari camping days when the real safari experience was provided, as David’s Father did all his life from East to Southern Africa. The rustic, but stylish camp has been created from a mixture of the authentic safari mood with a traditional rural African touch. Each of the seven fully serviced safari tents with semi-attached bathrooms, including a bucket shower and flush toilet each, are set on the edge of the riverbank. A hundred feet below camp is the water hole that attracts thousands of animals during the dry season. A lot of emphasis in the camp experience is placed on the theatre view from camp, and so no matter where guests are they may watch the scenes played out, whether from the plunge pool, their tents, the verandas, or the bathrooms. The safari camp cuisine is prepared in a way it is as much of a safari experience as all the other phpects of life in the bush. They cook on the campfire BBQ Botswana beef fillets, BBQ chicken, BBQ chops, and grilled fish, and these are supplemented with fresh vegetables and salads. Puddings, cheese, biscuits and fresh tropical fruits end the meals on a sweet note. Picnic lunches are supplied for day trips into the national parks. Wildlife viewing by 4X4 safari car into the parks and reserves are dependent on where the seasonal wildlife is concentrated for water and food, determined by rainfall. There is actually no need to leave the camp during the dry season as most of the wildlife in the area will drink from the lodge’s water hole at camp. This is a perfect opportunity for guests to take a break from game drives and to sit quietly and watch the wildlife from the comfort of camp. Relaxing in camp. The camps water hole attracts enough wildlife to just stay in camp and relax, after days of busy activities on safari this is a welcome option. The dry season (May to November) is most productive for the zebra and wildebeest migration. Bird life is impressive all year round. Day trips from camp Licensed, experienced, and knowledgeable guides lead the day trips to three protected Kalahari wilderness areas all year round. An impressive packed picnic lunch and drinks are provided for these safaris. Day trips are dependant on wildlife movements, influenced by the rains, and limited available surface water. Below is a list of where to go when. Nxai Pan National Park including Baines’ Baobabs All year round. The pumped water hole is best in the dry season, (May to November). Makgadikgadi Saltpans Access onto the pans is possible during the dry season, (May to November). Zebra and Wildebeest migration, Makgadikgadi Pans National Park. The herds concentrate on the Boteti during the dry season, (May to November). The migration moves through the national park to the saltpans during the rains, (December to May). Boteti River All year round for general wildlife, the zebra and wildebeest migration drink along the riverbed during the dry season, (May to November). Bird varieties increase and start breeding during the summer months, (September to May). After breakfast, you will be driven back to Maun Airport, in time to connect with Air Botswana, flight BP211, departing Maun at 15h00, and arriving back in Johannesburg at 16h40. Priced from: US $ 3 145 per person sharing.